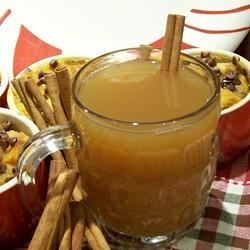 "This recipe uses an automatic coffee maker to brew the cider. If you don't own one, heat it in a slow cooker or a saucepan over medium heat on the stovetop. Grab your mugs and dive into this hot drink! Clean your coffee maker according to the manufacturer's instructions before using for coffee again." Place filter in coffee basket, and fill with brown sugar, allspice, cloves, cinnamon stick, salt, nutmeg, and orange wedges. Pour apple cider into coffee pot where the water usually goes. Brew, and serve hot. Very good! I made it in the crock pot using a coffee filter and a piece of ribbon to keep the spices in.